Lessons with examples, solutions, and videos to help High School students learn to use the law of sines. In any given triangle, the ratio of the length of a side and the sine of the angle opposite that side is a constant. 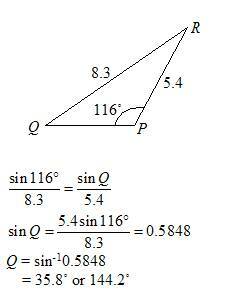 The Law of Sines is also known as the sine rule, sine law, or sine formula. It is valid for all types of triangles: right, acute or obtuse triangles. The Law of Sines can be used to compute the remaining sides of a triangle when two angles and a side are known (AAS or ASA) or when we are given two sides and a non-enclosed angle (SSA). We can use the Law of Sines when solving triangles. Solving a triangle means to find the unknown lengths and angles of the triangle. If we are given two sides and an included angle (SAS) or three sides (SSS) we will use the Law of Cosines to solve the triangle. Solve triangle PQR in which ∠ P = 63.5° and ∠ Q = 51.2° and r = 6.3 cm. First, calculate the third angle. We will now consider the situation when we are given two sides and an obtuse angle of a triangle. 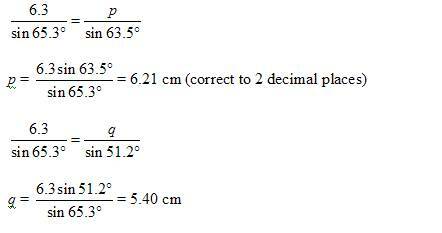 Solve ∆ PQR in which ∠ P =116°, p = 8.3 cm and q = 5.4 cm. Q cannot be an obtuse angle because the sum of angles in the triangle will exceed 180˚. The only valid value for Q is 35.8˚. 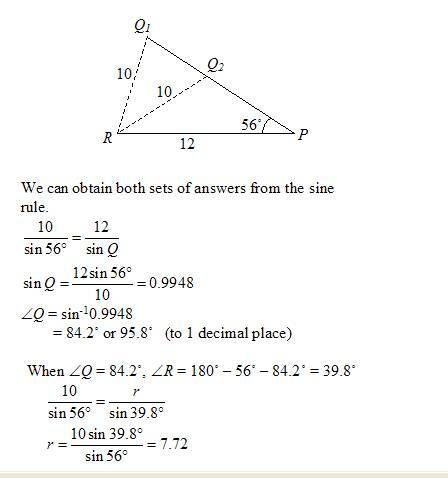 How to solve triangles using Law of Sines? We will now consider the situation when we are given two sides and one angle of a triangle. If you are given two sides and a non-included acute angle and the side facing the given angle is less than the other side, you would obtain two sets of answers. The solution is said to be ambiguous. Notice that we can construct two different triangles from the given information. How you may get two solutions when using the Law of Sines? How to use the Law of Sines to tell if there are 0, 1, or 2 solutions. The following video will show a proof for the law of sines. This video solves the following application using the law of sines. Example: Standing on the back of a canyon, a surveyor notices a tree at a bearing of 115°. Then, the surveyor walks 300 meters. The bearing of the tree is then 85°. What is the distance across the canyon? A group of forest rangers were hiking through Denali National Park towards Mt. McKinley, the tallest mountain in North America. From their campsite, they can see Mt. McKinley, and the angle of elevation from their campsite to the summit is 21°. They know that the slope of the mountain forms a 127° angle with the ground and that the vertical height of Mt. McKinley is 20,320 feet. How far away is their campsite from the base of the mountain? If they can hike 2.9 miles in an hour, how long will it take them to get to the base? A person has a kite out on 1750 ft of string at an angle of 75° with ground. An observer notes that the angle formed by the kite and the flier is 102°. How far is the kite from the observer? How to solve a word problem that involves using the Law of Sines? You are on a hill and can see two building in the distance. Suppose the buildings are six miles apart. If you are 3.2 miles from one building and the angle between the two lines of sight to the buildings is 30° 30', how far are you from the second building? Two wires help support a tall pole. One wire forms an angle of 48° with the ground and the other wire forms an angle of 72° with the ground. The wires are 20m apart. How far is the pole?